Is it Monday already? With all that went on since Friday, we lost track of the weekend. It was a busy weekend for poker, live and online. We got down to two in the WSOP Main Event, Full Tilt signed someone huge, gold jerseys were handed out, and more. Without further adieu, we bring you the day's top poker stories. It took close to 15 hours to get down to heads-up play. For those of you trying to read the news and not spoil the final two players of the World Series of Poker Main Event, we won't do it to you. For those of you who know or don't and want to find out, read this about this guy and that guy making it to heads-up play. There has been some speculation as to whether Tom "durrrr" Dwan would be signing with Full Tilt Poker. Rumors were everywhere. Rumors no more. Tom "durrrr" Dwan is Full Tilt Poker's newest Team Full Tilt member. PokerStars is trying to get you to the Bahamas for the PokerStars Caribbean Adventure. Why wouldn't you play? It's a freeroll and it's the Bahamas. You don't need to tell us twice. November Nine Freeroll Series Continues has all the details. The World Series of Poker has things covered on the West Coast and the World Poker Tour is covering your poker fix in the East. They were down to ten this morning at the WPT World Poker Finals at Foxwoods. Matt "AllInAt420" Stout is on top of the chip leaderboard, but plenty of pros hope to change that. Find out who he has to battle in World Poker Tour Foxwoods, World Poker Finals: Matt Stout Headlines the Final Ten. Sunday was just like any other Sunday on the virtual felt, except the FTOPS is in full swing. The Sunday Briefing: FTOPS XIV Rules the Weekend has your scoop on the winners of the weekend. December 1 is a few weeks away and that means the UIGEA will go into effect. Some members of Congress are trying to delay the UIGEA while others are writing letters opposing those delays. Bump in the Road for Online Poker has more. Well, by now, many of you probably know who the final two players of the 2009WSOP Main Event are. If you don't, this video won't spoil anything for you. Gloria Balding caught up with Daniel Negreanu on Saturday night to talk about side bets and Darvin Moon's chances. Be sure to follow the Live Reporting Team tonight at the Live Reporting page and Twitter as we cover the WSOP Main Event action live. During the radio broadcast of the WSOP Final Table on Saturday,Joe Sebok made a huge announcement. Want to know what it is? Ok, we'll tell you. Joe Sebok and Scott Huff, along with Joe Stapleton as the writer, will be coming to your TV sets with a poker news show called "Poker2Nite." The show will air nationally on FoxSports every week. The first episode will be shot on Nov. 17 and will then air on Nov. 18 at 11 p.m. Congratulations guys! Read more at Seebs blog on PokerRoad.com. I think we've said this before, but we'll say it again: it's never a good idea to try to cheat a casino. They will get you. These guys found that out and now there are two new geniuses who tried to pull a fast one on a casino. William Reece Lancaster and Mark Vernon Edmiston from Missouri were charged by a Tulsa federal grand jury for using fake poker chips at Seneca Cayuga Grand Lake Casino. The two used the chips for almost a month and authorities believe they got away with over $25,000 of the casino's money. They were cashing in the fake chips and exchanging them for real chips. They introduced the fakes into play and were detected by security. Our advice: don't steal from "the Man," you'll get caught. Erik Seidel was recently seen in the background of an episode of "Curb Your Enthusiasm." The guys on TwoPlusTwo were all abuzz wondering whether it was actually him or whether their eyes were playing tricks on them. Seidel confirmed via his Twitter (@Erik_Seidel), that it was actually him. A huge fan of the show, he apparently got the opportunity from a charity auction that he attended. 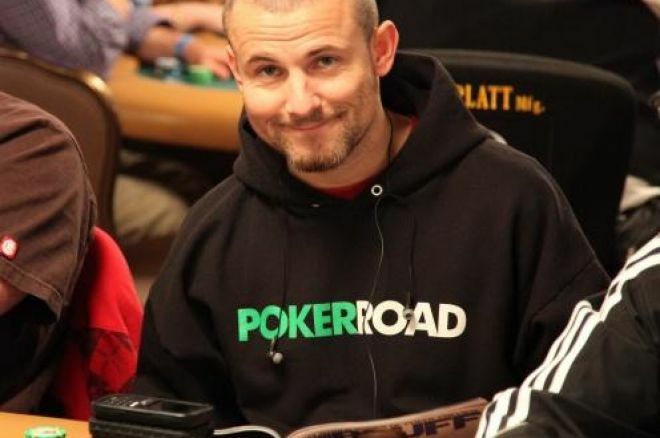 In his blog, Ilari "Ziigmund" Sahamies tells us that he will be playing Tom "durrrr" Dwan in a $500,000 pot-limit Omaha heads-up challenge. The challenge will take place sometime next week in London. Rules of the game: Players cannot quit until they have reached 500 hands or the minimum buy-in of $500,000 has been lost. Also, the challenger gets to pick the game. Since Ziigmund is a PLO specialist, this was an easy choice for him. "It is a cool challenge, and it's fun to play against a good friend of mine. I think durrrr is one of the best PLO-players in the world, maybe in top 3," says Sahamies. "I've been winning a lot lately and I have had a good feeling about poker lately, so of course I want to play against Tom. We agreed on the challenge today." "But I am actually looking forward to the after-party in Jalouse or some other cool night club more than the heads up," he said in typical fashion. The challenge will take place either on Nov. 17 or 18. Read more at Coinflip.com. The FTOPS wasn't the only poker tournament running this weekend. The Bodog Poker Open IV Championship Event was held on Sunday, and "MrElPaso" came away the winner. For besting the 257 entrants, MrElPaso takes home $36,447.50 and will be featured in a multipage spread in an international poker magazine as well as on Bodog.com and the Bodog Beat. Sign up for a Bodog account today.